On Day One I set off for Newlyn in anticipation (and, it must be confessed, a twinge of anxiety) at the prospect of two days’ immersion in printmaking. My fellow students – Claire, a visitor from Australia and occasional ‘dabbler’ in art, Teresa, maker of jewellery, and Paul, a painter who works from the nearby Trewidden Studios – were, as it turned out, also strangers to the medium. The imposing granite building near the top of Chywoone Hill was formerly a Victorian school. It is located not far from the Forbes School of Painting which flourished between 1899 and 1938, giving rise to the Newlyn School of Painters and its famous exponents of ‘plein air’ painting. Our studio, with its lofty ceiling and original wooden floors, was light and airy with views across the town. It doubles as a life drawing studio, where classes take place every Wednesday evening. A re-conditioned Hunter Penrose etching press takes pride of place in the rear section, with working areas along each wall, and all the necessary paraphernalia within easy reach. Our tutor, Rachael Kantaris, instantly put us at our ease, demonstrating a simple monoprinting technique as ‘a springboard to get you going’. This method requires a minimum of equipment: a large sheet of plate glass, etching inks, a roller for each colour, a pair of scissors and several sheets of A4 paper. Overlaying one colour on top of another, while blocking off selected areas, produces some intriguing effects. 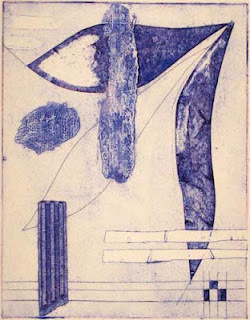 This type of monoprint is attractive to novices since the single, unique result is achieved merely by applying one’s hand to the paper. Rachael encouraged an instinctual approach, suggesting, once we had gained confidence, that it was time to ‘think about the edges’. Any lack of definition was easily remedied by the application of additional pressure along the margin of the image using a pencil, or even a thumbnail. I found that the latter produced a freer, less inhibited line, and a more pleasing outcome. Applying the corner of a rag soaked in white spirit to the surface, an interesting ‘swirling’ textural effect could be created. By lunchtime each of us had a row of attractive monoprints taped to the wall, waiting to dry. The afternoon session was devoted to a more complex monoprinting process, this time using a paper drypoint plate. This exercise required some forward planning, taking into account the fact that the printed image would be the reverse of that on the original plate. Also, we needed to consider that layering or blocking off sections would create an impression of depth, bringing some elements to the forefront, while others receded. Manipulating the large handle of the etching press gave one a feeling of total control, yet when the printed image was finally revealed, the result was both unexpected and breathtaking. I was hooked! By Day Two we were ready to explore collagraph. As the name would suggest, this method operates on the basis of collage. Armed with a stanley knife, my fear of drawing became a distant memory as I cut boldly into the surface of the plate, creating a trio of leaf shapes. For the rest of the morning we played with textures, embellishing selected areas with masking tape, parcel tape, sellotape or tissue paper stuck to PVA. We discovered that a grainy effect could be achieved by the application of gesso (a mixture of PVA, polyfilla and water) which acts as a surface on which to leave the imprint of a piece of textured fabric or wallpaper. After the plates were dried and painted with shellac, we were ready to apply a layer of colour, this time using half of an out-of-date store card to scrape the ink onto the surface under pressure ‘like marmite, rather than jam’ as Rachael said. This was then buffed with scrim, followed by tissue paper. A sheet of etching paper which had been left to soak in water was dried between layers of absorbent paper. Once more the press performed its magic, and we were delighted with the results. Rachael then suggested we remove the ink from the plate and repeat the process with different colours, producing some interesting effects. As she remarked, ‘if something goes wrong with it, it can be a gift’. Experimenting with a variety of surfaces certainly makes for unpredictable and intriguing results. Our final exploration into printmaking was the carborundum method, which involved etching an image with a stylus onto a perspex sheet, then infilling selected areas with PVA, to which grit was applied, to create a velvety effect. While for me personally carborundum lacked the appeal of collagraph, we were all astonished by the results achieved within a very short space of time by painter Paul, who had confessed to feeling invigorated by the ‘completely different mind-set’ required for printmaking. A fine portrait of himself with his wife and young son was an impressive conclusion to two days which we had all found tremendously enjoyable. I was reminded of Grace Gardner, who discovered the delights of monoprinting after moving to Cornwall in 1984 in her sixties, and who regularly re-visits this medium, which has informed her art practice ever since. Indeed, when I interviewed her for a recent article, she was working on some prints in her studio upstairs. To have Rachael as our tutor was a real privilege. A natural teacher, full of enthusiasm, encouragement and endless patience, she communicates a passion for printmaking which is infectious. A student at Brighton University (she made her way across town to the campus on rollerskates!) in 1992 she attained an MA in Fine Art Printmaking. After graduating, a spirit of adventure led her to seek out studios in Berlin and Melbourne, where she gained valuable experience. Next, she had a spell in Manila, exhibiting and teaching printmaking at the University of the Philippines. Closer to home, she has worked closely with Hugh Stoneman, Breon O’Casey and Naomi Frears. 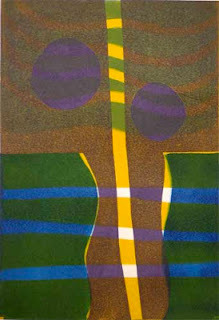 In the late 1990s she collaborated with Wilhelmina Barns-Graham as a master printer on a series of etchings, as part of the artist’s ‘Scorpio’ series – a project requiring the highest level of skill, carried out over several months. Rachael also has a great deal of teaching experience including stints working for Tate St Ives and Newlyn Art Gallery. She was instrumental in setting up the Porthmeor Print Workshop in St Ives, from where she works. The next Introduction to Printmaking course at Newlyn School of Art takes place on 13th and 14th June, tutored by Rachael Kantaris. Places are limited, so early booking is advisable. 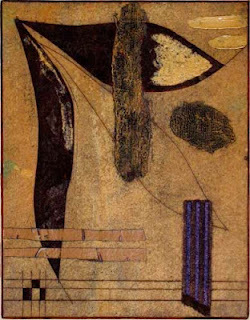 Newlyn School of Art was founded by Henry Garfit, beneath whose genial demeanour lies a profound commitment to supporting local artists and re-affirming the status of the town as a centre of artistic excellence. A privately run, not-for-profit enterprise which has benefited from generous Arts Council funding, the School offers a variety of short courses ranging from Oil Painting to Stone Carving. 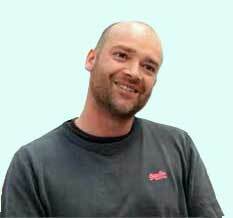 The Figure Painting course, with Royal Society portrait painter Jason Walker, has attracted a great deal of interest. The next Figure Painting course will take place from 6th to 8th August. Another popular class is Watercolour, with the acclaimed Maggie O’Brien (11th and 12th June). In association with Tate St Ives, Newlyn Art Gallery and Penlee House Gallery, Newlyn School of Art also caters for those with a passion for art history. A one-day course takes participants on a tour of these iconic locations, under the guidance of tutors who have much to offer through their own unique perspective on the artistic heritage of Newlyn and St Ives. 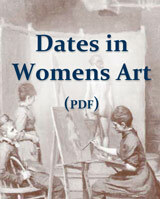 The next Art History day takes place on Saturday 30th June. Details of all courses can be found on Newlyn School of Art’s excellent website. The newsletter gives details of latest developments at Newlyn School of Art. 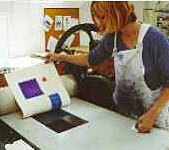 Helen attended the Introduction to Printmaking course at Newlyn School of Art in Cornwall on 2nd and 3rd May. Thank you, Lesley, for your kind comment. I am hoping to do some monoprinting at home soon - it doesn't require much in the way of equipment, and was such good fun.